A shift in winds caused up-slope, because of the warmer temperatures on the ground and the colder temperatures aloft, we saw convection initiate along the front range foothills and plains. Due to the intense lift (from combined convection and up-slope) some areas saw intense areas of rain, others intense areas of snow and others thunderstorms. Keep in mind, spring in Colorado is a roller coaster. One may see snow, hail, rain and tornadoes all in the same day. To understand how our weather turned out yesterday we’ll cover a coupe of weather basics. Convection of air is caused when warm moist air rises into a cooler, drier layer of air aloft. Yesterday we had an excellent set up for this as it was quite warm in the morning. A surface low and associated cold front enhanced moisture and lift available along the front range. Due to this process most areas saw thunderstorms yesterday, thunder was heard from Fort Morgan to Highlands Ranch at one point or another. South of Denver, temperatures dropped due to the cold front, this allowed snow to fall from these thunderstorms. If one of these bands of convection sets up over an area and is producing snowfall, it can result in a period of quick, intense snowfall. Models have a hard time predicting stuff like this. 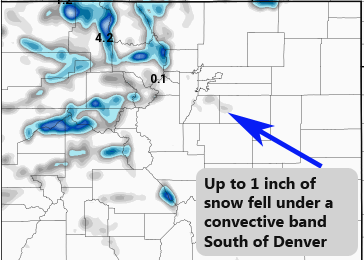 In fact, none of the models except for one had any snowfall accumulating South of Denver. These types of setups can catch meteorologists off guard, we can generally tell if there will be convective snow in a forecast, but it is very difficult to predict where it will be or how intense it becomes. There is still quite a bit of moisture in the air today along the front range. 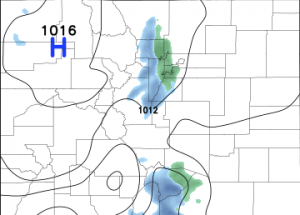 The energy left over from yesterday’s front and storm systems could combine later this afternoon and into the evening to produce up-slope again along the front range. It is looking likely that a shift in the winds this evening will mean another shot of snow and rain for areas along the front range. Denver and points North should mainly see rain but higher altitudes South of Denver (Palmer Divide, Castle Rock, Parker, etc…) will likely see snow. Just like yesterday, some areas may see heavier bursts of snow for a short period of time but overall accumulation (if any) look light. After Tuesday we should see a return to warmer, drier and spring-like weather. I’ll have a post up about that on Wednesday most likely. One note: with all the spring-like weather it is easy to say winter is over. I’ve seen some media outlets and online blogs already declaring winter over for Colorado. Don’t be so sure! A lot of models are hinting at “something” coming later this month, so don’t be fooled!